The dreaded air puff test has an important goal-- it tells your doctor the pressure inside of your eye. A range of pressure between 10 and 21 mmHg is considered normal, but some people are going to have higher pressure and it still be normal for them. The air puff (or non-contact tonometer) is a preliminary screening tool. If your pressure is high, it does not mean you have glaucoma. If your pressure is normal, it does not mean that you don't have glaucoma. Your eye pressure is going to be different depending on the time of day, the medications you take, whether you are sitting or lying down... Lots of things can vary. But over the course of several years of pressure data, your doctor is compiling a trend for your "normal" pressure, which can help them find suspicious changes with time. For example let's say you have a pressure of 10 for several years, and the next year we check your pressure and it is 18 mmHg. That is still a normal pressure reading according to our "average range", but it is not normal for you! I don't want to make this too complicated, but when the doctor looks at the surface of your eye in the microscope, they are checking for numerous medical conditions, including suspicious structural changes that could cause acute spikes in your eye pressure. If the anatomy of your eye where the cornea meets the iris (colored part of the eye) is very narrow, you are in a higher risk category for having this acute spike. This is something your doctor measures at every examination, and will record in your chart whether this structural meeting place is "wide open" or grade the amount of narrowing on a scale of 1 to 4. If you are in the 1-2 range on this grading scale (very narrow), your doctor will be discussing the signs and symptoms of an acute angle closure attack. If you have acute onset redness, pain, blurry vision, and halos around lights, you need to be seen immediately! Is the size of the cup the same in both eyes? If you have one large hole and one small hole, there is a greater chance that the eye with the large hole has a disease process. Usually in nature we are symmetric in anatomy, so we would expect the right and the left eye optic nerve to look the same if it was healthy and normal. Is the size of the cup the same as last year? As 10 years ago? This is where photodocumentation is pivotal. In a normal eye, the size of the hole in the nerve will not be changing from year to year. If you have photos of your eye over a lifetime, it can be very beneficial to have your doctor compare to check for gradual changes. If you started out with a smaller hole and now have a larger hole a few years later, that is very suspicious for glaucoma. Is there bleeding around the nerve? A hemorrhage near the nerve is often a sign of glaucoma (called a Drance hemorrhage). The bigger the nerve, the bigger the cup. This is a just a rule of thumb -- not everyone has the same size optic nerve. If you have a larger optic nerve, your doctor expects you to have a larger hole inside the nerve. What is a normal size hole in one person with a large nerve, could be a major glaucomatous process in another person with a smaller nerve size. It is all relative! 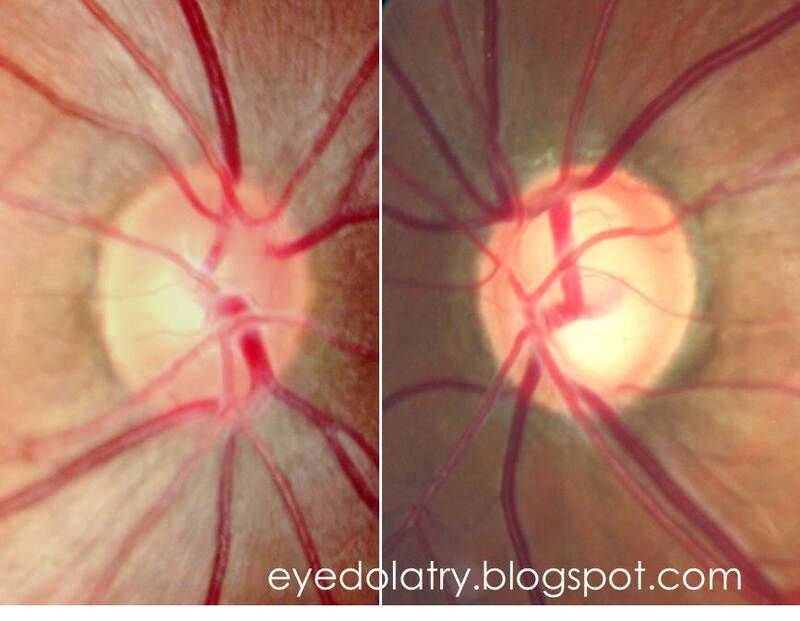 This picture is from the right and left eye of the same patient. 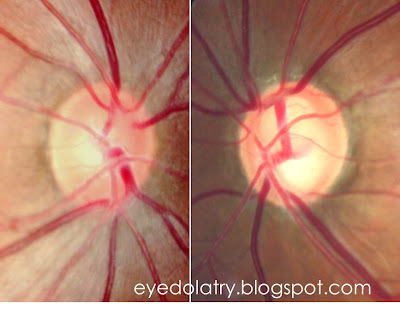 Look at the asymmetry of the cup or hole inside the optic nerve! The large hole inside the nerve on the right side of the photos is a major giveaway that this person probably has advanced glaucoma. Are you confused yet? Diagnosing glaucoma takes years of training, and that is why you are trusting in the care of your doctor year after year. If there was one simple test to find glaucoma, people wouldn't still be going blind in this country from the disease. The more often you get your eyes checked, and having years of data in one location for quick comparison can help your doctor diagnose glaucoma much faster -- long before your nerve has been damaged to the point of no return. If you wait until you have advanced glaucoma causing peripheral vision loss to see your doctor, the damage to the eye is then irreversible. All of the things mentioned in this post are performed in your doctor's routine ocular examination. It is not just about getting your glasses prescription! If you feel there is any doubt whether your doctor has screened these items, maybe it is time to find a doctor that you trust to ask. These are not the only tests for glaucoma--if any of these checks raises suspicion, they are likely going to bring you back for further testing. They may check your pressure with different machines to verify accuracy, map your full peripheral vision in a visual field test, and scan the thickness of the nerve to a comparative database with an OCT image. All of these are more advanced screening tools, but again, can not offer a definitive diagnosis by themselves. If you are worried you have glaucoma due to a family history it is best to get yearly eye exams and always get records from your previous doctor if you move or change physicians so all of your lifetime of data is in one place! Diagnosing glaucoma takes a compilation of data, and all the data that is recorded at your routine eye exam is useful to finding this condition early, before it has a chance to cause permanent vision loss.